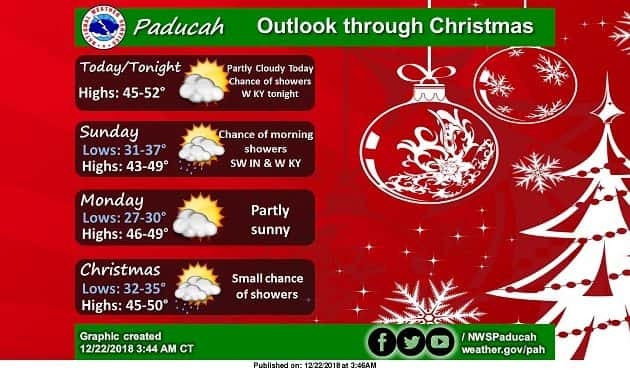 From the NWS in Paducah…Partly cloudy skies will be the rule today as temperatures reach the mid to upper 40s to even the low 50s in some locales. A weak front will bring a chance of showers to parts of west KY tonight, which will linger into the morning hours on Sunday and also could impact parts of southwest IN by then. Dry weather returns Sunday afternoon and lasts through Christmas Eve. We could see some precipitation sneaking into parts of southeast MO/southwest IL late Christmas Eve night. Small chances for showers will be with us on Christmas, but highs will be in the 45 to 50 degree range. Much better chances for widespread rains will arrive by Thursday.